Eportfolio. The name needs to go for a start. How remote are the chances of a five syllabic moniker catching on? TELEDA has reached its penultimate teaching week and eportfolio is a word of the moment. These collections of digital artefacts challenge the monopoly of traditional text based assessments. You can’t submit a multimedia assignment through Turnitin (yet). How do you assess differential digital literacies? Which platform do you use? The TELEDA answer to the last question is anything you want. An eportfolio is a digital narrative – a journey – a story – usually from the past to the present with directions for the future. It’s about the content more than the container. How it’s presented is less important than the message it carries. There are two components to an eportfolio. Reflection on – and evidence of – learning with hyperlinks between them both at appropriate places. Eportfolio have been around for some time. Conceptually at least. They represent everything wrong with elearning over the past decade. A perfect example of trying to find a one size fits all technical solution to digital ways of being. One platform to rule them all. The perfect capture of digital identity in a virtual world. A place you can keep for all time with control over visibility of its different components. The search has been on for ever yet google have been doing this for some time. Impossibilities seem to be centre on the transfer of digital content from a password protected network into the hands of individuals. A pack up and go solution with total protection built in. But nothing online is secure. Nothing is more nor less safe than the real world. Eportfolios have overtaken the needs of the individual. They represent the clash between private and corporate ownership of information and communication technologies. It’s time to rethink the eportfolio future, in particular where it’s a tool for teaching and learning or professional practice. In the war to find an all-singing-dancing technical answer, the battle of critical thinking and reflective developmental practice is being lost. This obsession over a new, as yet undiscovered, answer to collecting artefacts detracts from the purpose of a story being told, the narrative of a learning journey and the personal over coming of obstacles and challenges along the way. The power of the internet to enable digital story telling is immense. Those who want to push their creative digital boundaries can do so through the mass of free multimedia software. Personal information can be anonymised. This is the evidence. 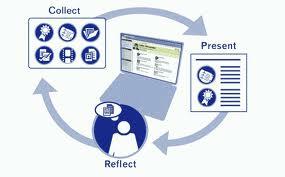 The core of an eportfolio is reflection; a synthesis of learning. This is the text. Keep it simple. We have the tools. Let’s start using them and work forwards from there. I’ve spent the week up close and personal with eportfolios. I love them! What a challenge. I can’t imagine a better way for demonstrating evidence of learning outcomes on a course designed for teaching and learning in a digital age. eportfolios step you outside the confines of a Word document. Hyperlinks and multimedia bring your assignment to life. This is creative non-fiction at its best. Neither frivolous nor irrelevant but bringing students and tutors face to face with digital literacies and digital scholarship. Higher education needs to loosen up. Explore the affordance of digital communication. Engage students in the application of their digital worlds to education. As far back as 2008 JISC’s Learner’s Experience of elearning showed students arrive on campus with a variety of digital tools but little idea of how they can be used for learning. The Great Expectations of ICT report in 2007 found use of the internet and social media was the norm for those planning to come to university. The tools are all in place. We need to reinvent how we use them for teaching and learning. The divide between those comfortable with the technology and those still resisting engagement continues to widen and deepen. As learning curves get steeper individuals stay within their comfort zones. I understand. I cant use refworks. I get lost in GoogleX. As for the Blackboard Grade Centre I might as well give up and go home. Coming face to face with the reality of using eportfolios for assessment has been a shock, a surprise and a revelation. More difficult than I anticipated but this is what happens when the theory hits the fan. Properly resourced and supported, eportfolios, may be an answer to encouraging toe dipping into digital waters, extending what is known, exploring what isn’t. I’ve been impressed with my eportfolio experience. It hasn’t been easy but nothing worth while ever is. I think there ‘s scope for revisiting how eportfolios can support digital graduate attributes, teacher education and staff development. I for one would be happy to take this forward. There are so many places to be online and I want only one. Ideally this blog is my one stop shop. A snapshot of who I am and what I do. So this needs to include photographs. But my relationship with WordPress and images has always been fractious. The NextGEN Gallery tool did what I wanted. Then something broke and instead of fixing it a new media tool was added. Now I have to start from scratch when hundreds of pictures of projects and colleagues are already uploaded through NextGEN. The Media tool contains the promise of linking to NextGEN but when I try nothing happens. I used to like the Social Homes Widget link to my Flickr Photostream. Then Flickr changed format and my account settings split into old and new. Both with the same url. I can move between them in Flickr but the widget only showed old images when I wanted new ones. I added a NextGen Widget to the side bar instead. It gives me the thumbnails I want but they open onto a blank page. I wonder why the tool is still there when it doesn’t work. A Jet Pack image widget only gives a broken link although everything looks like it’s filled in correctly. Maybe it only takes certain URLs and not others. This is about digital literacies. I could do better but I do try and I’m not digitally illiterate. WordPress frustrates me; it always has done. It offers multiple ways to work with images but none of them do what I want. Linking the different elements of your life online should be easier than this. Plus it takes time. There is never enough time and when you can’t achieve your aims it feels time is wasted. I never know if it’s me or the technology but either way the result is too often not doing things because you can’t make them work. I’ve stuck with this for several reasons. The assessment for the short course Teaching and Learning in a Digital Age is an eportfolio and there are a few other projects across the university looking at WordPress as an eportfolio tool. Text only blog posts are boring. Images can ‘educate, inform and entertain’. They are essential components of any eportfolio environment and I’m interested in how we support eportfolio construction at Lincoln. WordPress is ok. I like it a lot but when it comes to usability I think it could be better. Plus it’s Monday morning – never the best part of the week – and sometimes it’s cathartic to start the week with a good grumble!